Celebrity chef Anthony Bourdain has died at age 61. "It is with extraordinary sadness we can confirm the death of our friend and colleague, Anthony Bourdain," a spokesperson for the network said in a statement Friday morning. "His love of great adventure, new friends, fine food and drink and the remarkable stories of the world made him a unique storyteller. His talents never ceased to amaze us and we will miss him very much. Our thoughts and prayers are with his daughter and family at this incredibly difficult time." In 2013, Bourdain began hosting the food and travel show Parts Unknown on CNN; he was working on a new episode in Strasbourg, France, when he took his own life. Bourdain's close friend, French chef Éric Ripert, found Bourdain unresponsive in his hotel room Friday morning. A Travel Channel spokesperson added, "We are stunned and deeply saddened to hear that the world is now without its global ambassador, Anthony Bourdain. He was an incredible talent who showed us beautiful, gritty, complicated and delicious places in every corner of the world. His wit and perspective will be missed. Our thoughts are with his family at this difficult time." Publisher Daniel Halpern, president of Ecco, gave E! News a statement regarding the chef's death. "I've known Tony as an author and friend for many years. He not only revolutionized the memoir genre with his groundbreaking and iconic work Kitchen Confidential, he supported emerging voices and chefs with his imprint Anthony Bourdain Books," he said. "His death is a great personal tragedy. Our thoughts are with his daughter and family at this difficult time." Season eleven of Parts Unknown premiered on the network last month. The hit series has received five Emmy Awards (from 11 nominations), and in 2013, Peabody Award judges honored Bourdain and Parts Unknown for "expanding our palates and horizons in equal measure." They praised him for being "irreverent, honest, curious, never condescending..."
Born on June 25, 1956, in New York City, Bourdain spent his formative years in Leonia, N.J. The son of a Columbia Records music executive and a New York Times staff editor, his love affair with food began during a family vacation to France, when he tried his first oyster on a local fisherman's boat. Years later, Bourdain dropped out of Vassar College and enrolled in the Culinary Institute of America, graduating in 1978. In the following decades, he ran a number of popular kitchens in New York City, including One Fifth Avenue, Sullivan's and the Supper Club. In his twenties, when he was on his own, Bourdain became addicted to drugs. "I was a complete a--hole. Selfish, larcenous, druggy, loud, stupid, insensitive and someone you would not want to have known. I would have robbed your medicine cabinet had I been invited to your house," he said during a Reddit AMA session in 2013. Calling himself a "very unusual case," Bourdain added, "Most people who kick heroin and cocaine have to give up on everything. Maybe cause my experiences were so awful in the end, I've never been tempted to relapse." Bourdain also suffered financial hardships for much of his life. "I don't want to sound like I'm bragging about this, but the sad fact is, until 44 years of age, I never had any kind of savings account," he told Wealth Simple in 2017. "I'd always been under the gun. I'd always owed money. I'd always been selfish and completely irresponsible." Weed "was a major expense," he added, costing him a few hundred dollars a week. Looking back, the fact that I'd been smoking weed heavily since I was 14 might have had something to do with my relative lack of ambition." Before Kitchen Confidential was published, Bourdain confessed he was "constantly in debt." It wasn't until years after he found success that he started saving. "The reports of my net worth are about ten times overstated. I think the people who calculate these things assume that I live a lot more sensibly than I do. I mean, I don't live recklessly—I have one car. But I don't deprive myself simple pleasures. I'm not a haggler. There's not enough time in the world. I tend to go for the quickest, easiest, what's comfortable. I want it now," he admitted. "Time's running out." Bourdain gained notoriety in 1999 after he published a New Yorker article, "Don't Eat Before Reading This." It became a best-selling book in 2000, Kitchen Confidential: Adventures in the Culinary Underbelly, leading to shows on Food Network, Travel Channel, and, eventually, CNN. 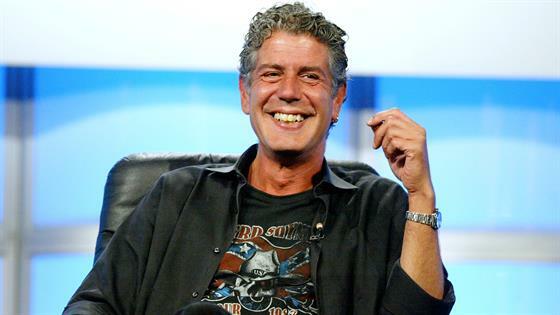 Adventurous and outspoken, Bourdain won over millions through his numerous books and essays, as well as by hosting A Cook's Tour and No Reservations and guest starring on Top Chef. "I joke about not giving a f--k being a very good business model for me, but it's true. The absolute certainty that nobody was going to buy or read or care about Kitchen Confidential was what allowed me to write it. I didn't have to think about what people expected. I didn't care. And as a result, I was able to write this book quickly and without tormenting myself. And that seemed to work out and I learned from that experience and I tried very hard," he told First We Feast in 2016. "Whether I'm meeting with a group of television executives or telling a story, I don't think about 'the fans.' I don't think about what audiences expect, and I'm not afraid of what will they think of me, or what if they don't like it and I'm not on television anymore." The celebrated author and chef was married twice in his lifetime, first to Nancy Putkoski (1985–2005), then to Ottavia Busia (2007–2016); he and Busa welcomed a daughter in 2007. Bourdain is also survived by his girlfriend, Asia Argento, whom he met in Rome two years ago. Bourdain's tragic death happened after fashion designer Kate Spade hanged herself in an apparent suicide Tuesday. "Kate suffered from depression and anxiety for many years," her husband said in a statement in the wake of her death. "She was actively seeking help and working closely with her doctors to treat her disease, one that takes far too many lives..."